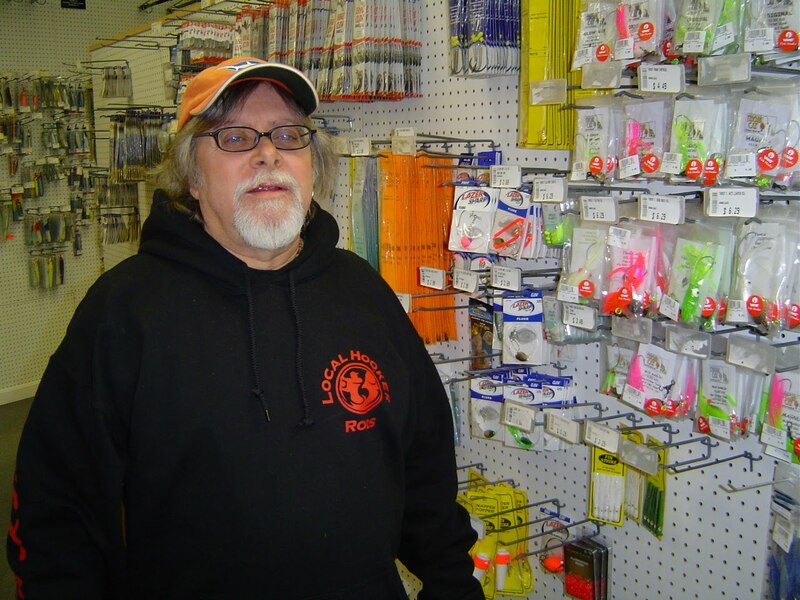 Captain Thom Pelletier, an associate at Quaker Lane Outfitters, North Kingstown said, “Monofilament line on reels should be replaced each year” as the line has memory and can become a tangled mess quickly whereas braid line can last for a couple of years. Captain Thom poses with a display of his fluke rigs in the background. Big fish are caught in early spring when you get your gear ready for the fishing season. When you are out fishing it is too late to make sure your rod, reel, line and fishing tackle is in shape to handle that big fish. And, there is nothing more frustrating than spending an hour or more of fishing time getting the day’s tackle ready. So, before you start to fish, get your gear ready. Here are some tips from the pros on how to get your gear ready along with the drill that I use every year to prepare for the fishing season. Each year, replace most used line. This is a judgment call as to what is meant by “used”. Three out of eight of my rigs with braid line are showing signs of wear… they are a bit frayed. Two of them need all the line replaced, one of them which has plenty of line on it just needs the worn line at the beginning of the spool taken off. Ken Ferrara of Ray’s Bait & Tackle, Warwick said, “A lot of guys cross braid line when spooling onto conventional reels to prevent the line from digging into the spool when a big fish is on.” Ken also suggests re-spooling lead line putting the used portion on the reel first, “This way you use line that is new as most anglers rarely use more than three to four colors (90’ to 120’) of line.” I plan to replace all of my reels with monofilament line. Some anglers put new line on two to three times a season depending on use. Monofilament line has memory so it tangles easily and creates bird nest tangles when it is old or has been sitting in the cold for a while. Also stretch the line, the first 100 feet (of monofilament line) to relax its memory and avoid tangles. When you change any type of line it is important to spool tight or the line may slip on the spool. Give your reels a good cleaning, particularly when the line is off. Grease where directed by manufacturer, often times, the reel is marked where to do this. If instructions are long gone do not hesitate to stop by your local bait or tackle shop to ask where to grease. Do not be afraid to ask questions, that is what they are there for. By the way, do not grease the drag, it is not meant to be greased, if you do, it will not work. John Littlefield of Archie’s Bait & Tackle, Riverside, RI, said, “Anglers often forget to put oil on the line guide worm gear on bait caster reels as this is can go a long way allowing the gear to perform properly throughout its lifetime.” John says that he charges $10 to $15 to clean and grease your average spinning reel. Archie's Bait & Tackle has a new location this year at 292 Bullocks Point Road, Riverside, RI. This time of year the store is open for business 7:30 a.m. to 5:00 p.m. most days. Call 401.437.2630 if you have any questions. Use wire leaders for blue fish and monofilament or fluorocarbon for striped bass. Blues won’t bite though the wire and striped bass will find it harder to see the monofilament or fluorocarbon leaders. Make sure leaders have no nicks or stress marks from fish pulling. If they do, replace them. I switched most of my hooks to circle hooks, I did this so I can safely catch and release undersized or unwanted fish (particularly striped bass). Circle hooks are designed to hook the fish at the corner of the mouth and not down in the belly. All hooks should be sharp and rust free. Ken at Ray’s Bait recommends VMC hooks as they do not rust and come in all types and sizes. Opening day is Saturday, April 9, 6:00 a.m. for salmon, trout and charr. Get you gear ready. Licenses are required for anglers fifteen (15) years of age and older. You can purchase a fishing license at city and town halls as well as at license agents. Visit the Department of Environmental Management’s web site for a list of agents, a list of trout waters that have been stocked, “Kids Only” ponds and much more at http://www.dem.ri.gov/ . The first annual recreational fishing tournament to be held out of the port city of New Bedford is scheduled for June 17-18, 2011, with Pope’s Island Marina serving as home base. Proceeds from the charity tournament, called Fishing for a Cause, will benefit the Schwartz Center for Children. Complimentary boat slips will be provided on a first-come, first served basis and early registration is encouraged. Registration deadline is June 1, 2011. For more information visit www.schwartzcenter.org/fish-on. Shallow Water Striper University is March 25, 26, and 27 at the Sheraton Airport Motor Inn, Warwick, RI. This weekend long event features some of the best local professionals who make their living catching big striped bass. Registration for this event is $89. for the entire weekend. There will also be charter trip give-a-ways, raffles, prizes, and more. 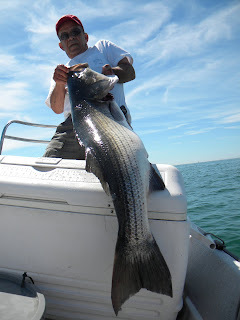 Contact Debbie Wood at Wood Boat & Motor, 401-739-4040 or visit http://www.shallowwaterstripers.com/ . Captain Mike Pierdinock of CPF Charters will speak on shark fishing and his great adventure of tagging a 16 foot great white shark last year that was captured in a 20 minute video. Also the Rhode Island DEM Division of Law Enforcement will speak on the duties and mission of environmental police. Rhode Island Saltwater Anglers Association (RISAA) members can bring a guest to this meeting at no charge. Non-member donation is $10. The seminar is Monday, March 28, 7:00 p.m. at the West Valley Inn, West Warwick. Food served 5:30 to 6:30 p.m.
Top photo: Robert Ballou (left) of DEM’s Fish & Wildlife Division answers questions from anglers as he and his staff issue saltwater fishing licenses at the New England Saltwater Fishing Show this weekend at the Rhode Island Convention Center. Bottom photo: Lisa DiRaimo, executive director of the RI Marine Trades Association, answers a question from Peter Magnan (right) of No Fluke Charters in the Boats Work for Rhode Island booth at the Saltwater Fishing Show this weekend. The Rhode Island Marine Fisheries Council met last week and approved many saltwater recreational fishing regulation recommendations for the 2011 season. The recommendations have been passed along to Janet Coit, director of the Department of Environmental Management (DEM), for her consideration and approval. A final decision on most regulations is expected to occur by month’s end. Here are four popular species targeted by recreational anglers and what was recommended by the council. Striped bass regulation recommendations are the same as last year or as the recommendation reads “status quo”… two fish/angler/day and a size limit of 28” or larger with an open season. The Fluke (summer flounder) bio mass has rebuilt nicely so the recommendation is to loosen regulations to seven fish/angler/day (up one fish per day from last year) at a minimum size of 18 ½” (was 19 ½” last year) with a May 1 to December 31 season. A new twist (that may or may not be approved) is that for shore anglers only, one of the seven fish can be 16 ½”. The Rhode Island Saltwater Anglers Association (RISAA) advocated for this special shore angler recommendation. The scup bio mass is rebuilding nicely too. The council approved a status quo recommendation which is a ten fish/angler/day limit with a 10.5” size limit and a season from May 24 to September 25. Party and charter boats have an 11” size limit with a June 8 to September 6 season at ten fish/angler/day and a September 7 to October 11 season at a 40 fish/angler/day limit. Tautog is being managed more carefully with reduced split seasons and the same size limit of 16”… April 15 to May 31 and then August 1 to October 15, both at a three fish/day limit and then a six fish/day limit from October 16 to December 15. A twelve fish per vessel limit is recommended which does not apply to charter and party boasts along with an eight fish per angler limit for those fishing on charter and party boats. As related, all of the above RIMFC recommendations are expected to be considered with approved regulations being made by Janet Coit, DEM director, by the end of month. Lisa DiRaimo, executive director of the Rhode Island Marine Trades Association and their Boat Works for Rhode Island initiative, said, “We have participated in the RISAA fishing show for a number of years. Attendance this year was great.” Boat Works has over 180 member companies and institutions including marine training schools and programs, boat manufactures, marine support industries and supply firms. 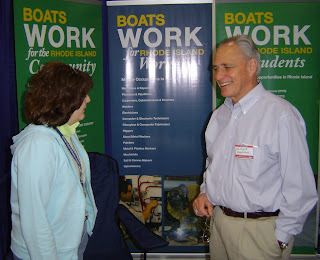 Ms. DiRaimo said, "With a mission of marine industry advocacy, education and job development we had a lot of interest at the booth in regard to the new boating tax proposed by the governor as well as questions about the education and job opportunities in the marine industry.” Boats Work for Rhode Island is a workforce development initiative that advocates for some of Rhode Island’s greatest assets… Narragansett Bay, the Atlantic Ocean and the marine industry. According to a recent study quoted by Boats Work for Rhode Island, the marine industry has over 2,000 businesses, 6,600 jobs and generates $260-million in wages in Rhode Island (the industry represents nearly 10% of all private employers in Rhode Island). Rhode Island's recreational saltwater license program took effect in 2010. It provides recreational saltwater anglers and spear fishermen with a convenient, cost-effective way to meet new federal requirements without having to register federally. The cost of the license is $7 per year for RI residents and $10 per year for non-residents (compared to a $15 cost for a federal license). A temporary seven-day license is also available for $5. The license is free for anglers who are over 65 years of age and for active military personnel who are stationed in RI. No license is required of anglers under 16 years of age, for anglers fishing on licensed charter and party boats, for anglers who are on leave from active military duty, and for anglers who are blind or permanently disabled. The license program is expected to generate better data to manage fisheries at the state, regional and federal level. Recreational anglers are now accessible for surveys and studies because contact information will be available. Better data and science helps fish mangers do a better job as policy is based on more facts rather than projections. If you registered last year you must register again this year. Licenses can be obtained online at: http://www.saltwater.ri.gov/. Licenses may also be obtained at participating vendors, which are listed on the website. The Senate has approved a resolution sponsored by Sen. V. Susan Sosnowski calling on the Bureau of Ocean Energy Management, Regulation and Enforcement (BOEMRE) to involve fishermen in the development of offshore energy projects.Senator Sosnowski is the chairwoman of the Senate Task Force on Fisheries, which was established to provide a forum for individuals and organizations in the fishing community to present their ideas and the challenges they face. In her resolution (2011-S0137), Sosnowski requested that BOEMRE include official representation of offshore fishermen on the Rhode Island Offshore Renewable Energy Task Force.“Offshore fishermen should certainly be included on a task force that is making decisions that could affect their livelihoods,” said Senator Sosnowski. “This will provide many opportunities for them to participate in all review and permitting phases of offshore renewable energy projects and outline how, exactly, these projects could affect the fishing industry in the state.”The resolution also calls on the BOEMRE to establish a mitigation policy for all offshore development projects that would require developers to provide mitigation to fishermen who are negatively impacted by these projects. 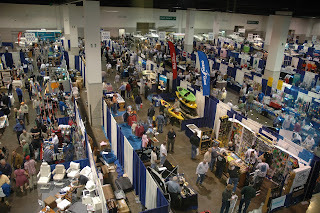 The New England Saltwater Fishing Show (nesaltwatershow.com ), the largest of its type in the Northeast, will have over three-hundred fishing related companies displaying, two-hundred of companies will be selling products offering show specials and discounted show prices. The show is at the Rhode Island Convention Center, this Friday through Sunday. 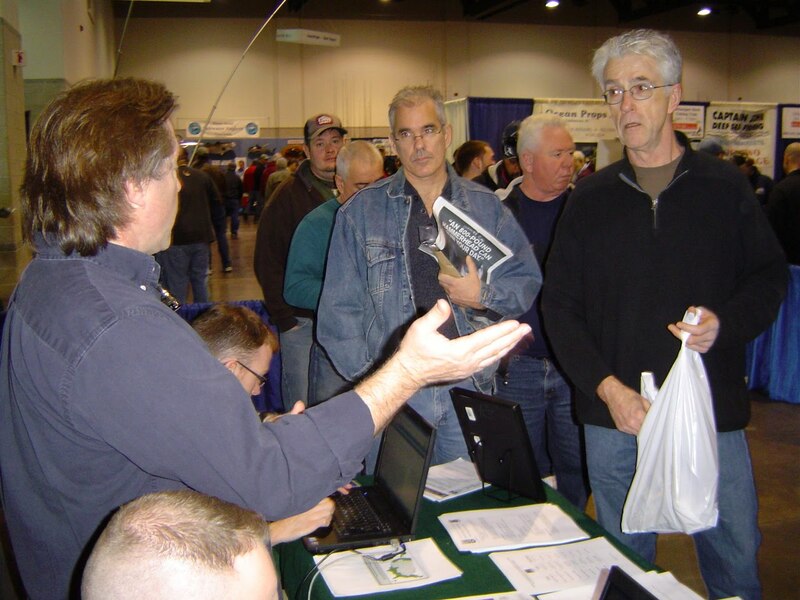 The Eighth Annual New England Saltwater Fishing Show sponsored by the Rhode Island Saltwater Anglers Association (RISAA), will be held this week March 11-13 at the Rhode Island Convention Center. Friday hours are 1:00 p.m. to 9:00 p.m., Saturday, 9:00 a.m. to 7:00 p.m. and Sunday, 10:00 a.m. to 5:00 p.m.
Steve Medeiros, RISAA president, said, “This is the largest saltwater fishing show in the Northeast. 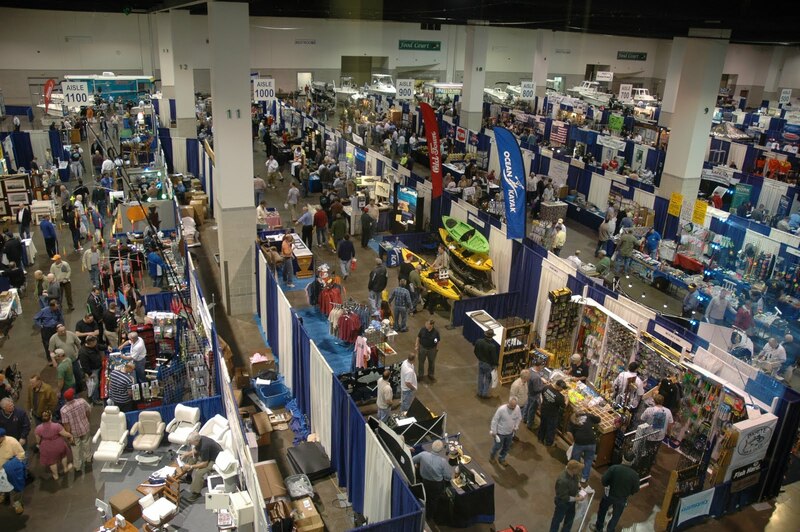 This year we have over three-hundred companies displaying their latest in fishing tackle and gear and two-hundred of them will be selling their products, many with show special low prices.” Most major saltwater companies will be represented including rod and reel manufactures, fishing lure companies, fishing charter boats and guides and makers of clothing, fly fishing gear, boats, kayaks and much more. You will even be able to get a Rhode Island or Massachusetts fishing license at the show. A new “Kid Zone” will be featured this year with a kids casting area and fishing game, a Sea Tow Kid’s Cannon game, a FLW Speedboat Driving Simulator and on Sunday a BIOMES Marine Center and a special scavenger hunt for children. Sunday is also family day with all women and children admitted free. Seminar speakers include No Fluke columnist Captain Dave Monti. His seminar “Tautog experts and striper decline” will be presented Friday at 7:30 p.m. and Sunday at 2:30 p.m. No Fluke Charters will also have a booth at the show, #522, so stop by the booth and say hello. Other guest speakers and their topics include Captain Mike Neto, “Block Island Stripers”, Friday 5:30 p.m. and Saturday 4:30 p.m.; David Giuliano, Block Island Kayak Fishing, Friday 6:30 p.m. and Saturday 1:30 p.m.; Captain Bruce Macomber, “Light Tackle Sharking”, Saturday and Sunday 11:30 a.m.; Captain Jim White, “Advanced Tactics for Striped Bass Fishing”, Friday and Saturday 3:30 p.m.; Lee Samson, “Fish the Surf”, Friday 4:30 p.m. and Saturday 2:30 p.m.; DJ Muller, “Surfcasting the Islands : Cuttyhunk, Martha’s Vineyard, and Block Island”, Friday 2:30 p.m. and Sunday 10:30 a.m.; Ron Z. Poirier, “ Introduction to Jig & Pop Tuna Fishing”, Friday 1:30 p.m., Saturday 5:30 p.m.; Curt Caserta, “Hunting for Block Island Bass”, Saturday and Sunday 12:30 p.m.; Bob Oberg, “Wiring Up- Increase your kayak fishing productivity, safety and enjoyment with good electronics”, Saturday 10:30 a.m. and Sunday 1:30 p.m.; Sheila M. Hassan, “Fly Fishing Demos/Seminars”, Saturday and Sunday 1:00 p.m. in the Fly Casting Area; Captain Bob Hines, “Intro to saltwater fly fishing”, Saturday 2:00 p.m. and Sunday 3:00 p.m. in the Fly Casting Area; and David Porreca, “How to chose a saltwater fly rod… simplify your choice”, Friday 6:00 p.m. and Saturday 5:00 p.m. in the Fly Casting Area. Last week the RI Senate Special Task Force on Fisheries heard testimony on how to bring fresh RI fish to markets in State. The Task Force heard testimony from Perry Raso of Matunuck Oyster Farm. Mr. Raso testified to some of the challenges fishermen have and the difficulties they encounter to bring their catch to market. Janet Coit, director of the Department of Environmental Management (DEM) attended the meeting along with a number of Senate Task Force Committee members as Mr. Raso related the need for an enhanced DEM inspection staff to handle important fishery inspections required by Federal and Regional fishing regulators. I will continue to report on Task Force activities as their work develops. Senator V. Susan Sosnowski’s Special Senate Task Force on Fisheries has taken on two big issues this winter on behalf of fishermen…wind power and bringing their catch to market…fresh. Both issues are on the front burner; here is how the Task Force is addressing them. At the first meeting of the Fisheries Task Force on December 6, 2010, a number of witnesses (fishermen) raised concerns about the potential impacts the development of offshore wind projects could have on the fishing industry and fish resources. This testimony has resulted in a resolution that is being discussed and possibly voted on this week by the Rhode Island Senate Environment and Agriculture Committee which is also chaired by Senator Sosnowski. The resolution respectfully requests the Bureau of Ocean Energy Management, Regulation, and Enforcement (BOEMRE) to comprehensively involve Fishermen in the development of offshore energy projects. Captain Rick Belavance, president of the Rhode Island Party & Charter Boat Association, said, “A void existed between the new federal BOEMRE bureau, the State’s Ocean SAMP and fishermen. We had input into planning through the SAMP process but the Deepwater Wind project double in size over night and was located in prime fishing grounds without input from fishermen”. Chris Brown, a Rhode Island commercial fisherman and past present of the Commercial Fisheries Center of RI, said, “Fishermen were left out of the loop with no input to where this wind project was sited.” The resolution asks the Rhode Coastal Resource Management Council within the Ocean SAMP program to be a conduit that brings fishermen’s concerns to BOEMRE. The resolution can be found at http://www.rilin.state.ri.us//BillText11/SenateText11/S0137.pdf . Will report on the outcome of the resolution next week. The Special Senate Task Force on Fisheries has had two meetings on bringing locally caught fresh fish to market in Rhode Island. The first was held on February 9 and a second on March 2 to hear testimony on how to bring fish caught by Rhode Island fishermen to market here in the state. The idea is to provide Rhode Islanders with better access to fresh, wholesome and nutritious native caught Rhode Island fish and to provide fishermen with better access (and possibly more direct access) to Rhode Island markets so they can earn more for their catch with fewer middlemen involved. On February 9 the Task Force heard testimony from a variety of State agencies, companies engaged in fishing, processing of fish and/or the marketing of fish and Farm Fresh Rhode Island. Highlights of the meeting included the following. Mark Gibson from the Rhode Island Department of Environmental Management testified about the condition of our fishery in Rhode Island. Species by species he thumb nailed the current status and/or relative health of commercially harvested fish… fluke (or summer flounder), monk fish, cod, striped bass, scup and most others seem to be in good health. Scup was singled out as a species that is very “abundant” and a species we could plan to harvest aggressively if a commercial market existed. Lobster fishing in Rhode Island was the only fishery that was down to a very low historical level. The lobster industry was characterized as a fishery in trouble. Senator Sosnowski said, “We had Kevin Adams from Alaska talk about a proposed regional marketing approach, and other enthusiastic presenters.” This week the committee will hear testimony from Perry Raso of Matunuck Oyster Farm as well as public testimony on how local seafood products are marketed and distributed as well as ways to bring fish to market in Rhode Island. How to educate consumers about the benefits of eating local seafood to increase demand will also be discussed. Highlights of this second marketing committee meeting, which took place Wednesday night will be covered next week. Advisory panels of the Rhode Island Marine Fisheries Council made their 2011 saltwater fishing regulation recommendations this Tuesday, February 15 at a public meeting. Recommendations will now be finalized by DEM and the Council for formal recommendation to the Director of DEM. Due to a healthy fluke (summer flounder) fishery the recommendation approved by the Director will likely be more liberal than last year. The proposal that garnered most support at the public hearing was proposed the Rhode Island Saltwater Anglers Association which was seven fish/day/angler with a minim size of 18 ½” (last year’s limit was 19 ½”). An interesting twist this year was that for shore anglers only, one of the seven fish could be 16 ½ “ . Striped bass recommendation was status quo… two fish/angler/day with a minimum size of 28”. Will relate highlights of the new regulations once they are approved by the Director which is expected to occur this month. The Fish and Wildlife Division will hold public workshops in Providence and Tiverton to discuss the proposed 2012-2013 freshwater fishing seasons and the 2011-2012 hunting seasons. Proposed changes to Parks and Management Area Regulations will also be heard. Public workshops will be held on Tuesday, March 29 at DEM headquarters in the Foundry Building at 235 Promenade Street in Providence, and on Wednesday, March 30 at the Tiverton Rod and Gun Club, 1529 Fish Road in Tiverton. Both workshops will take place at 7 p.m.
A public hearing on the proposed regulations will be held on Wednesday, June 1 at 7 p.m. in the Warwick Police Department's Community Room at 99 Veteran's Memorial Drive in Warwick. Copies of the draft regulations will be available at the public workshops. March 11-13, New England Saltwater Fishing Show at the Rhode Island Convention Center sponsored by the RISAA. Visit www.risaa.org/events for details. March 22, West Bay Anglers striped bass seminar by Charley Soars on fishing for bass with live bait, Sherman Elementary School, Warwick, RI. Reserve tickets ($10) at 401.463.7532. March 25-27, Shallow Water Striper University, Sheraton Airport Motor Inn, Warwick, RI. Contact Debbie Wood at Wood Boat & Motor, 401-739-4040 or visit www.shallowwaterstripers.com . Charley Soares with a large bass he caught using live bait will be guest speaker at a March 22, 6:30 p.m. seminar for the West Bay Anglers. The seminar called “Live baits for trophy bass” will take place at Sherman Elementary School, 120 Kelley Avenue, Warwick, RI. For the past two weeks I reported what organizations, bureaus, captains, anglers and scientist felt was happing to striped bass. No one knows what is happening to the bass for sure. But here is an analysis of what they had to say and what we might be able to do to preserve the species. What we do know is that striped bass have declined in Narragansett Bay and along the coastal shore in Rhode Island as related by hundreds of anglers. We also know that from the “Young of the Year” survey in the Chesapeake that small fish are on the decline but not at critical levels. We also know that environment and weather conditions can impact fish (and striped bass). Bob Wood, biologist for the National Oceanic Atmospheric Administration (NOAA), has conducted research that focuses not so much on the fish but on the weather. He believes the weather pattern in the North Atlantic called the Atlantic Multidecadal Oscillation (AMO) is responsible for the wide swings in striper populations. We also know that fishing captains and guides, commercial fisherman and lobstermen, particularly those that fish the ocean have spotted thousands of striped bass in large schools in places they normally have not been seen before. Also, all last summer anglers and captains consistently reported a strong bass bite at and around Block Island. We also heard from lobstermen that the striped bass were plentiful and became a nuisance by eating lobsters and bait in pots. So what is one to think, are striped bass in decline or not? I do believe they are on the decline, along the RI coast and in Narragansett Bay. It may be due to the overly wet weather, cloudy water, warm water and/or the AMO effect related above which effects food supply and bait. Coastal waters, bays and rivers are affected by these factors differently than the open ocean. The decline may be a natural cycle too of a fall, a rise and leveling off of a species. I spoke with Captain John Brierley who is a commercial striped bass fisherman on Buzzards Bay. John believes we may never know the cause of recent striper decline however he does have a few thoughts about what we can do. John said, “I doubt we will learn in the near future the real cause of the decline. So with the upcoming season we all need to do what we can. Maybe it is as simple as asking the guy who wants a full bag limit ‘when and who is going to eat (those fish)’… Or maybe it is using circle hooks and being more knowledgeable in the release (or) maybe you don't put as much fertilizer on your lawn this year. Dr. Chris Anderson, chairman of the State of Rhode Island Department of Environmental Management Marine fisheries Striped Bass Advisory Panel believes said, “Many young undersized school striped bass die each year due to poor catch and release tactics”. Dr. Anderson related that thousand of fish are caught in the upper Bay, in rivers and coves in Rhode Island that if released properly would live. So do your part to preserve striped bass, take only the fish you will eat, taking two fish each outing may not be the thing to do. Additionally, use circle hooks to protect the fish from deadly gut hooks and consider the below catch and release tactics. NOAA also recently published a catch and release pamphlet which can be found at www.nmfs.noaa.gov/ . One way to save bass is to use circle hooks. Here’s how they work…after the hook (and bait) are swallowed by the fish and it starts to run, the hook is pulled out of the stomach and slides toward the point of resistance on the fish’s jaw or lip and embeds itself in the corner of the fish’s mouth. Circle hooks successfully hook bass in the mouth 95% of the time. The trick is not to jerk the rod to set the hook. Let the fish run and it will pull the hook out of its stomach and hook itself on the lip. Once this happens the fish is hooked so all you have to do is start fighting the fish and reeling it in. Ask your local bait & tackle shop for circle hooks and/or purchase rigs that have circle hooks. To release undersized or large egg bearing striped bass (and other species) unharmed and/or to practice “catch and release” consider these techniques (most of them are courtesy of the Rhode Island Department of Environmental Management, Division of Fish and Wildlife). 1. Use circle hooks, they successfully hook bass in the mouth (not the gut) 95% of the time without hurting the fish. 3. Avoid putting fish on deck and letting it flop around, keep it in the water as much as possible when removing hook. 5. Handle fish carefully. Do not use excessive force when grasping the fish. Do not put fingers into gill cavities or eye sockets. 8. Return fish to water quickly. Place fish gently in water in upright horizontal position. Move it back and forth in the water to force water across its gills. Once the fish revives, allow it to swim away. The DEM Marine Fisheries Tautog Advisory Panel met last week and approved their final recommendations to the DEM Director for the 2011 season. Fish must be 16” (same as last year). Three fish/day/person are allowed for the split season from April 15 to May 31 and then from August 1 to October 15; from October 16 to December, 15 the recommendation is six fish/person/day. There is a private boat limit of twelve fish/vessel during all periods. The Department of Environmental Management is stocking rainbow trout in ponds for the winter ice-fishing season. This week they will finish stocking a total of 3,000-4,000 rainbow trout in six ponds. Ponds to include Barber Pond in South Kingstown, Silver Spring Lake in North Kingstown, Olney Pond in Lincoln, Stafford Pond in Tiverton, Round Top Ponds in Burrillville, and Carbuncle Pond in Coventry are being stocked with rainbow trout. The hatchery-raised trout weigh between one and two pounds each. The US Fish and Wildlife Service’s Nashua, New Hampshire federal hatchery provided DEM with 150 surplus domestic Atlantic salmon broodstock which will be stocked in Olney Pond, Carbuncle Pond, and Barber Pond. Don Villani of East Greenwich, RI caught this striped bass north off Conimicut Point, Warwick on No Fluke Charters last spring. Fish like this were in lower numbers this year signally a striper decline for many in Narragansett Bay and along coastal RI shores. Striped bass are a valued species, both for sport fishing and food. Striped bass are as highly managed today as they were in the past. They were the subject of our first conservation laws… in 1639 Massachusetts forbade the use of the fish for fertilizer, in the 1660’s they were the focus of our first environmental impact statement and passage of the Natural Environmental Policy Act. According to a Rhode Island Saltwater Anglers Association (RISAA) study, recreational fishing has a $160,000,000 annual economic impact on Rhode Island. There are more recreational striped bass fishing trips in Rhode Island than any other species (my personal observation). So striped bass play an important role in Rhode Island’s recreational fishery and economy. Last week this column reported on striper decline. Anglers, fishing captains (particularly those fishing Narragansett Bay and coastal Rhode Island shores), said the striped bass fishery is on a terrible decline. Many say their catch is down by 30 to 40%, yet scientists, fishery managers and some captains say the fishery may be down but by no means is it crashing. Other captains say they caught more fish than ever before off Block Island and have seen large numbers in Federal waters where they cannot fish for them legally. And, offshore lobsterman say striped bass have been more abundant in traps than ever before (they are considered a nuisance because they eat valuable lobster bait in traps). Last week and this week, I asked striped bass experts, “Are striped bass in decline?” and what do you think about the recent NPR story on striped bass. Here’s what they had to say. Christopher Joyce did an NPR story on striper decline highlighting the work of Bob Wood, biologist for the National Oceanic Atmospheric Administration (NOAA). Wood’s research focuses not so much on the fish but on the weather. He believes the weather pattern in the North Atlantic called the Atlantic Multidecadal Oscillation (AMO) is responsible for the wide swings in striper populations. Wood explains, “… if you warm the entire North Atlantic basin, you’re changing the weather because the air and circulation patterns above the ocean are affected.” Ed Martino, a fisheries scientist at NOAA, said, “You are talking about a difference in temperature and precipitation, and therefore river flow or salinity, ultimately all affecting the base of the food chain… It’s the way that the climate affects the microscopic plankton.” Plankton are the tiny plants and animals in water, and that’s what spring striped bass eat. Reporter Joyce relates that when it’s in a warm phase, springtime along the East Coast tends to be wet and cool with more rain, more water and more food. In the years following that phase striper numbers tend to go up. Then the AMO flips, drier springs bring less rain, less food and after a lag, it looks like striper numbers start to decline. Records for the past 100 years of fishing show this trend. Striped bass have not been as plentiful for the past four years. Wood said, “and it just so happens this is also the time when the AMO seems to be in a switching phase”. This switch is bad for stripers so the decline now and the one in the 1980’s could be attributed to these down cycles. I think this study is a breakthrough for fishery managers in the way they look at what is impacting data. They should consider what role (if any) AMO or weather patterns play in the growth or decline of fish populations. Also it begs the question as to how they should evaluate and implement the learnings of such research and data in the future. The question of whether or not striped bass are in decline will be covered in future columns. The West Bay Anglers will hold a series of striped bass seminars by Charley Sores Tuesday, March 22, 2011, 6:30 p.m. at the Sherman Elementary School, Warwick, RI. Topics to include fishing with a variety of live baits (part one of the seminar) as well as how to locate and catch stripers between boulders (part two). Reserve tickets ($10) at 401.463.7532. Shallow Water Striper University is March 25, 26, and 27 at the Sheraton Airport Motor Inn, Warwick, RI. This weekend long event features some of the best local professionals who make their living catching big striped bass. Registration for this event is $89. for the entire weekend. There will also be charter trips give-a-ways, raffles, prizes, and more. Contact Debbie Wood at Wood Boat & Motor, 401-739-4040 or visit www.shallowwaterstripers.com . The State Senate Task Force on Fisheries chaired by Senator Susan Sosnowski met last week to hear presentations on the marketing of Rhode Island fish. Over seven individuals from DEM, the RI Department of Economic Development as well as fish industry experts with knowledge on how to bring fresh fish to market made presentations. More on this in the future. The more I ask “Where have all the striped bass gone?, the more I realize the question should be “What is happening to the striped bass?” In the past year, a lot has happened to striped bass. They have been in the news more times than I can count. Many noted anglers and fishing captains say the fish are on the decline, yet there is evidence from some scientists, captains and anglers that bass may just not be where they normally are but are feeding in areas where anglers do not fish. In this and subsequent columns this month, I will recap what I have heard and read and what some experts have to say about striped bass. But first, a little history and a few facts about striped bass. Striped bass tolerate both salt and fresh water. They live in the ocean but spawn up rivers. In the spring striped bass prefer a temperature range of 55 to 68 degrees. Females grow larger than males. Most bass over fifteen pounds are female and can produce a million eggs for each ten pounds of weight. So rather than keeping the big fish, anglers are urged to release them to help preserve the fishery. A fish 30” can weigh 11 to 16 pounds and be 8 to 14 years old. A 40” fish can weigh 24 to 35 pounds and be 13 to 25 years old. This summer fishing writer Tim Coleman wrote in an editorial titled “New England’s coming striped bass collapse” that he and area shore anglers believed striped bass fishing has been substantially down for the past three to five years. Steve McKenna a noted shore angler from Cranston, RI said his bass landings were down 40% (Steve like many avid anglers practice catch and release), Richard Kalinoski of Little Compton, RI, said his landings were down over 60%. So anglers who normally land five hundred fish a year, were now landing two hundred fish a year. In addition to those fishing from coastal Rhode Island shores, anglers fishing Narragansett Bay from shore and in boats were down substantially too. While the controversy over striper decline continues, the species continues to make the news in ways that can shed light on the issue. · Small bass killed as commercial fisherman up-grade their catch impacts the amount of available young. Last month news and video footage (on YouTube) became available of North Carolina commercial trawlers tossing thousands of dead striped bass overboard as they “high-grade” for the largest bass while staying within their legal 50 fish limit. In an article for the Examiner newspaper, Captain Kelly, a top striper fishing guide on the Outer Banks said, “…It’s an atrocity … It’s gone on before but I think this was the first time it was in front of such a large crowd”. Last week we heard that the North Carolina Division of Marine Fisheries will replace the current 50-fish a day commercial trip limit with a 2,000 pound a day limit. This will encourage commercial trawlers to keep all fish, up to a 2,000 limit rather than culling their catch looking for 50 large fish. · Poaching of all types impacts the species. Poaching by anyone, recreational or commercial fishermen, has a negative impact on a fishery.This fall the Rhode Island Department of Environmental Management (DEM) charged Albert Reeves of Rehoboth, MA with poaching striped bass. DEM said they had information that Reeves was illegally taking over limits of striped bass in Rhode Island and selling them in Massachusetts and that he had the extra fish in a hidden compartment on his boat. The officers stopped him while driving on Route 1 in Rhode Island after fishing. Officers found a secret compartment that opened hydraulically with eleven (11) illegal fish (in addition to the two legal fish he had in his possession). Poaching in the Chesapeake kills fish that would normally find their way north to Rhode Island and beyond. Last week the Maryland DNR shut down the February striped bass gill net season after confiscating more than ten tons of illegally caught striped bass in two days. The illegal fish (over 20,000 pounds of our striped bass) came from four illegally anchored gill nets in the Chesapeake Bay. Authorities are concerned about the extent of the poaching and shut things down to investigate. These young bass are the very fish that migrate north to Rhode Island and New England, poaching such as this in the Chesapeake can have a huge impact on our fishery. This series on striped bass will continue next week. Jim Shriner (right) owner of Mill Creek Marine, and his some Jamie Shriner (left), at the Providence Boat show where they were showing Eastern boats and introducing their new rack storage facility at Allen’s Harbor in North Kingstown, RI. The first dry stack marina in Rhode Island is about to open at Allen’s Harbor, North Kingstown, RI this spring. Mill Creek Marine (formerly Johnson’s Boatyard in Wickford) will open the first dry stack marina with an initial capacity of 72 boats up to 38’ in length. Dry stack storage is a popular concept in Florida and other warmer climates particularly where coastal shoreline for marinas is limited. The cost of the service is $185/foot/year which is all inclusive of dry stack storage and launch service for the entire year. So, if you like the idea for dropping your boat off at the dock and not having a lot of cleaning to do or preparation work before getting underway… dry stack storage may be for you. Mill Creek Marine Inc. is a complete marine service company. They are an authorized serve center for Mercury/Mercruiser, Suzuki, Yamaha, Honda and Evinrude. They also carry used and new boats. Eastern is one of the new boat lines they carry. Visit their web site at www.millcreekmarine.com. or call Jim Shriner and his staff at 401.294.3700. Don’t forget the annual East Bay Anglers’ Fishing Expo taking place January 30th, 2011 at Barrington High School. Tickets are just $15 and can be purchased by visiting the show website at www.rifishshow.com . Speaker Dave Pickering, noted shore angler, has landed more than 50,000 stripers during his career and he has created an entirely new show to share his secrets. Mike Laptew, renowned as a diver-fisherman, brings a fish-eye perspective to underwater action with his bubble-free diving method that enables him to capture underwater views of striper life never seen before. I have listened to both speakers before, they are well worth seeing. Discounted fishing gear will be available at the flea market which opens to shoppers at 11:00 a.m. Presentations start at 1:00 p.m. For more information visit www.rifishshow.com or call show organizer Will Barbeau at 401.245.8375. Steve Medeiros, president of the Rhode Island Saltwater Anglers Association (RISAA), recently announced that the association has a full public policy agenda for 2011. In addition to introducing RISAA to a new governor, DEM director and general assembly, regulatory and public policy issues on the front burner this year include weighing in on management of the menhaden fishery as well as fishing regulations in general which will likely change. Steve Medeiros relates we can expect changes in fishing regulations, possibly an increase in fluke allotment which would likely mean enhanced bag limits and reduced size limits, and unfortunately. possibly tighter limits on other fisheries not doing as well such as scup and black sea bass. RISAA will also continue to advocate for the State’s artificial reef program, as well as for public access to the shoreline and public fishing piers. Ocean wind farms good... but at what cost? “The Deepwater Wind farm site doubled in size (to 200 turbines) and changed locations without input from fishermen. It will restrict fishing and could eliminate over $20,000,000 million in fish taken from the area.”, said Rick Bellavance, president of the Rhode Island Party and Charter Boat Association. “The wind turbines are located all around Cox’s Ledge and its fertile fishing edges, ledges and drop offs. The massive 270 square mile area taken will restricts commercial lobstering and fishing, tuna fishing and recreational fishing in the area… (the proposed wind farm) will also act as a blockage forcing vessels to add thousands of dollars in fuel to their fishing season as they try to get to fishing grounds on the east and south sides of Cox’s Ledge.”, Bellavance said. The Cox’s Ledge area is one of the most fertile fishing areas in the Northeast. Eighteen months ago, commercial and recreational fishing thought leaders in Rhode Island expressed concern over the consequences of spatial planning (zoning our ocean waters). The State of Rhode Island under the leadership of the Coastal Resources Management Authority (CRMA) has been a pioneer in this county’s effort to zone our ocean waters under their nationally acclaimed Special Area Management Plan (SAMP). Just as cities and towns zone land for use i.e. commercial, industrial, residential the oceans would be zoned for various uses as well as to insure sustainable and equitable use for commercial and recreational uses of all types. The biggest concern of fisherman was simply that the SAMP could translate into the elimination of many popular fishing areas. The proposed expanded Deepwater Wind farm that developed without sighting input from the fishing community is a violation of the trust that had developed between fishermen, CRMA and Deepwater Wind said Bellavance. “We were blindsided, this has a big impact on fishing. Rhode Islanders may have to decide if they want windmills or fishing unless the wind turbines can be moved to areas that do not impact fishing this much.”, Bellavance said. John Rainone, past president of the Rhode Island Party & Charter Boat Association said in an article that appear in this column last year, ”(spatial planning) is a way to stop recreational and commercial fishing in any areas that the government and special interest groups deem necessary.” Through new federal policy that aims to facilitate the development of ocean wind mills and our SAMP program in Rhode Island, fishing may be restricted from an area equal to about 22% the land mass of Rhode Island and if the Neptune wind farm project (our second proposed project) moves forward as planned the area taken which fishing will be restricted in will be about 33%of Rhode Island’s land mass according to a statement issued by Ted Platz, president of the Commercial Fisheries Center of Rhode Island (www.cfci.com). Bellavance said, that what is particularly alarming is that these are just the first two wind projects proposed for Rhode Island… what about the third, fourth and fifth. What impact will they have? What has allowed these projects to accelerate is a national policy that aims to reduce the amount of time it normally takes to site and develop an ocean wind farm from seven years to two years, cutting out a great deal of public comment and vetting time projects like this need and normally get. In December of 2010, Secretary of the Interior Ken Salazar announced plans to boost offshore wind power on the Atlantic Coast by identifying promising areas for development and then expediting the permitting process. Secretary Salazar said, “(the Atlantic wind farm initiative) will allow us to identify priority wind energy areas, improve cooperation with local, state and federal partners and accelerate the leasing process”. In Rhode Island, Deepwater Wind has done just this. They ceased the opportunity to build a wind farm twice the size that was originally planned under the SAMP and changed its location without input from the fishing community. This new Federal policy allows private developers to utilize our ocean, a public resource, with a drastically shortened time for public comment and input. Input from the people (fishermen) that have been utilizing the resource for hundreds of years to provide fresh and wholesome seafood to Rhode Islanders. I believe wind power is good, not bad. Just as the idea behind spatial planning is good as well as all the good work CRMA has done with the SAMP initiative However, I do believe we need to rebuild the trust between fisherman, CRMA and Deepwater Wind and move forward with a wind farm plan that presents the best use of the oceans for the common good… that allows fishermen, wind farms and others to use our ocean. John Toppa of Newport with a 20 pound cod he caught on a Francis Fleet vessel New Year’s Day. The cod was the largest fish caught on the boat that day. Cod fishing is great for children too. Andrew Martin of Warwick went cod fishing New Year’s Day with his uncle. That’s a school vacation experience that will give him plenty of stories to tell when back in school. Cod is an ideal species to target if fishing with children, because all they have to do is drop their line to the bottom. And, it is one of the most popular eating fish in New England. Cod are bottom fish that are basically lazy. They are not aggressively hunting, they pretty much stay on the bottom, often near structure (underwater wrecks, rock piles, holes, humps and drop offs), waiting for prey to come by. So you have to go to where the cod are to catch them. They are not likely going to come to you. New Year’s Day I went cod fishing with twenty other anglers on a Francis Fleet party boat. A coast guard inspected vessel that takes more than six people fishing is commonly referred to as a party boat. Cod fishing for a full day (7:00 a.m. to 4:00 p.m.) generally runs about $80 depending on whether or not you use the boats gear or your own. It takes about an hour to an hour and half to get to where the captain likes to fish for cod (usually Cox’s Ledge if you leave from Point Judith, Rhode Island). New Year’s Day was perfect, it was in the 50 degree range, seas early in the day were about four to five feet, but they laid down as the day progressed. Most every one caught cod fish on this trip. I caught four fish and two were keepers (cod must be 22” or longer to keep them). Some on board caught three, four and five fish. One angler who used jigs to fish most of the day caught eight. The largest fish of the day was caught by John Toppa of Newport, Rhode Island. His fish was 35 inches and weighted about 20 pounds. There were some anglers in their 60’s and 70’s and a number of them in their 20’s and 30’s and my favorite angler who I fished next to all day was Andrew Martin of Warwick who was thirteen years old. His uncle took him for this special fishing trip during holiday school vacation. He will have some good stories to tell when back in school. Overall it was a great fishing day on the water and a trip that I would recommend. Visit the Rhode Island Party & Charter Boat Association web site at www.rifishing.com for a complete list of vessels that fish for cod. Pick one with a heated cabin as it get pretty cold out on the ocean in January, February and March. A hook, sinker weight that holds the bottom and sea clams are often used as bait to catch cod. Jigs of various sizes, color and weight depending on conditions are used too. Cod will generally eat anything that is in front of them, they are not picky, but you have to get their attendion and jigs usually do a good job of this. A common rig used is a diamond jig with a colored teaser buck tail tied about 12 inches above the jig. Anglers often tip the jig and buck tail with live bait (a piece of sea clam). Most anglers use a traditional boat rod and reel to catch cod. A short, sturdy 30 to 40 pound test rod of five to six feet is common with a traditional real of similar weight capacity. A fifty pound test line (both braid and monofilament) are used. Captain Robb Roach of Kettlebottom Outfitters, Jamestown, RI has announced the publication of two new videos that are teasers for their new season of KBOP productions on Cox Sports. The teasers and a host of other videos can be viewed on YouTube or on demand if you have COX cable. One of the videos is about making fluke rigs (http://www.youtube.com/watch?v=VoM-dF-6Caw ) and the second one is about spear fishing for striped bass off Newport (http://www.youtube.com/watch?v=ZrSppgDpIZ0 ), both are great fun to watch. A number of Rhode Island Marine Fisheries Panel meeting open to the public are scheduled for this month. Anglers are welcome and urged to attend as these meetings allow all anglers to provided input into State Fisheries policy. The meetings include a Menhaden Advisory Panel meting scheduled for Thursday, January 6, 2011, a Striped bass Advisory Panel scheduled for Wednesday, January 12 and a Scup and Black Sea Bas Advisory Panel meeting scheduled for Wednesday, January 26. All meetings are scheduled for 6:00 p.m. at the UREI Bay Campus, Coastal Institute, Hazard Room off of South Ferry Road in Narragansett, RI. For additional information contact Jason McNamee at 401.423.1943.